In late 1880 the new narrow gauge Carson & Colorado Railroad began construction from Mound House on the Virginia & Truckee. For passenger service they ordered four new cars from the noted firm of Barney & Smith in Dayton, Ohio: two full coaches (Nos. 1 & 2) and two 3-compartment combination baggage-express-smoking cars (Nos. 3 & 4). These arrived in early 1881. In July 1881, the C&C received a mail contract. To make room, the express service was moved to attached box cars, and the mail service was installed in the combination cars. In the Fall of 1882 an additional passenger set arrived: coach No. 5 and baggage-mail-smoker No. 6. By 1883 the C&C had reached the Hawley (later Keeler) in the Owens Valley in eastern California. Traffic never lived up to expectations on the C&C, and so the three passenger trains proved sufficient for the 300 mile long line, operating in mixed train service. Passenger travel continued to decline, so in 1899 the passenger cars were rebuilt. Partitions were installed in the coaches creating a separate smoking section, and four revolving, reclining chairs were installed. The smoking section was removed in the combines and a mail section and combination baggage and express compartment were expanded to fill the car. Combine No. 3 returned to service after its conversion in September of that year. In early 1900 the C&C was sold to the Southern Pacific Company, who envisioned the line as a cutoff to Southern California. Within a year control of the Southern Pacific was acquired by the Union Pacific, who built their own cutoff to Utah. Also in 1900, gold was discovered in Tonopah, initiating a rush to the Southern Nevada mining regions. With more business than the old C&C could handle, the SP converted the northern end of the line to standard gauge in 1905, leaving the southern end narrow gauge. In 1938 the SP abandoned all but the Owens Valley narrow gauge trackage, making the old passenger cars surplus. Coach No. 5 was sold to Ward Kimball, and is preserved today at the Orange Empire Railway Museum in Perris, California. Baggage-mail car No. 3 was sold to Parker Lyon for his Pony Express Museum in Arcadia, California. 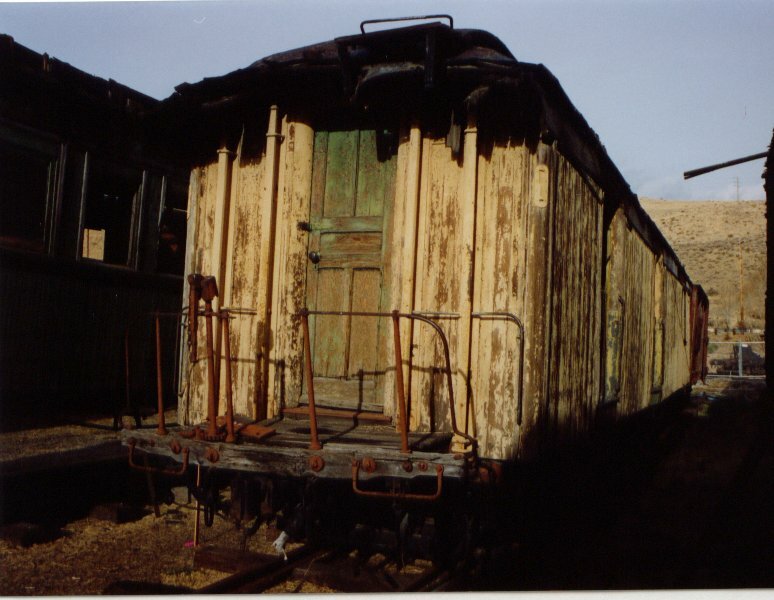 Lyon's collection was purchased by Bill Harrah in the early 1960s, and when the Harrah collection was broken up after his death, the car was donated to the Nevada State Railroad Museum, where it presently awaits restoration.